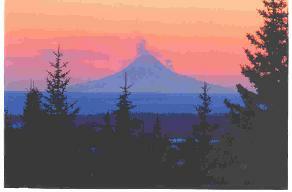 Mount Augustine is one of the smallest of the active volcanoes on the "Ring of Fire." She is located on the mainland opposite the lowest end of the Kenai Peninsula and is shown here during one of her frequent eruptions. The Summer That Never Was…..
Having been born and raised as a Washington drowned rat, it is surprising to me that the summer we have just passed is beginning to piss me off. I mean, even in Washington we get some sunshine, not this 27 day vacuum currently being endured in this, the most friendly environment in all of Alaska - The Kenai Peninsula. This year the weather is a duplicate of the regular climate of Southeastern Alaska - The Ketchikan, Sitka, and Juneau environments where is rains almost every day year around. Something like the Olympic rain forest in western Washington. But not on the Kenai, right? It rained at least part of the day for the entire month of July and part of August. We had to keep all the lawn furniture cushions under the picnic table umbrellas as a daily routine, particularly when we hit the sack. And we never even uncovered the picnic table the whole damn summer. The above photo may look posed or even phony, but trust me, it is real. This guy is known as the Yentna River Bear Man and I stole this picture from a picture story in the Anchorage newspaper. 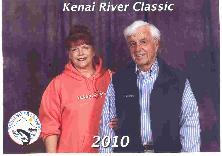 He really does have a small spread on the Yentna, a popular fishing stream that is a tributary to the Susitna River near Wasilla. He is known for his ability to communicate with the bear population and has been doing it for years. It is not a recommended procedure in light of other folks who have not survived.